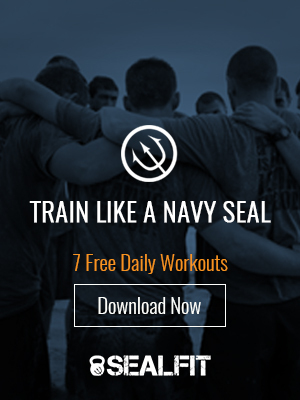 You are about to embark on an ultimate test of your mental toughness and emotional resiliency…Navy SEAL Hell Week. What’s my ultimate goal? Not just to survive, but to thrive. Why did I come here? To meet myself for the first time, and earn the honor of wearing the trident. How do I expect to achieve this? One ordinary moment at a time, using extraordinary effort. What resources do I have to draw upon? My strong mind, my strong body, my indomitable spirit, and my teammates. You picture yourself getting the crap beat out of you with your teammates on the grinder, smiling. Images of another Hell Week you saw on YouTube play in your mind for a reference point. Experiences at SEALFIT Kokoro Camp, where you instilled the warrior mindset, flash before you. You’re standing proud at the end of every evolution, helping your mates. Hours and hours of no sleep, but your mind’s still alert. Your body freezes in the ocean, but deep breathing controls your mental and physical responses. Gazing in the mirror five days later, you smile, bright-eyed. “Class, you are secured!” rings out as you embrace your surviving teammates in gratitude. A sense of euphoria and peace wash over you as you reach your visualized goals. Time grows short before you have to report with your class. You “charge up” for what’s to come, plugging into the electricity inside and all around you. “Tap into it,” you tell yourself. You’ll channel it for use during the week by maintaining the proper mental state, as if tuning to a radio frequency. You may be one of the few to experience what I described above, but chances are you aren’t and won’t, for good reason. It doesn’t matter. Replace the words “Hell Week” in the text above with whatever challenge you face. Developing a warrior mindset remains the same. Stay focused and relaxed, adaptable to the changing situation. Know that you are going to succeed – there will be no wondering. Tap into energy that lies deep inside, allowing you to be capable of at least 20 times what you think you are. Control fear and turn stress into success. Keep goals very short, and be prepared for whatever comes your way. Find humor in the challenge through a positive attitude that keeps you and your team motivated. Be decisive and confident, a true leader. P.S. As you may have heard, SEALFIT was on the Season Premier of ABC’s Extreme Makeover Weight Loss Edition, please click here to watch!